Written by Michelle Bufkin, AU Agriculture Communications Student/EDEN Community of Practice Social Media Assistant. 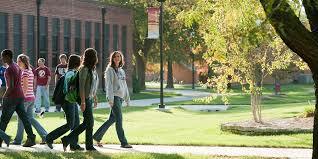 Safety is an integral part of the world we live in, and that is no different for students on a college campus. These tips should help parents and college students feel safer and more secure about starting college for the first time or returning to their campus home. 1. Know the look and location of campus emergency telephones. 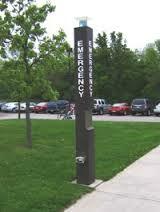 Almost all college campuses have emergency telephones located throughout the campus. You should know the general location and look of these phones before anything happens. In the event that someone is following you, press all the emergency phone buttons you pass along the way so that the campus police can track you and find you quickly. Locate where to go during a natural disaster in the buildings you will be spending the majority of your time, such as: where your classes are and the student center or cafeteria. Most campuses have posters or decals on the walls of places that are safe during a tornado or other natural disaster. Knowing this before a warning or watch is issued will help you calmly get to the safe location. 3. Pack an emergency kit. This kit can be a small one that you can carry in your backpack: It actually is better if it is small, because that makes it easier to carry. Make sure you comply with your campus rules when preparing this kit, such as some campuses do not allow knives. Some good items to include in your kit are: a phone charger, a whistle to help emergency officials locate you, granola bars, bottle of water, a miniature flashlight, a campus and local map, a paper list of emergency numbers: relatives, roommates, Resident Assistant, and apartment managers. You may think you are too old or too cool for the buddy system, but the truth is it really could help keep you safe; plus it is fun to hang out with friends. If there are two or more people together walking around campus, they are more likely to stay safe; because they are more alert to each other and the surroundings, and the likelihood of an aggressor confronting two people is lower than one person. Use this rule especially when walking around campus late at night or attending parties. If your school offers a free ride service, use that anytime you need to travel around campus at night. 5. Know how to react during an emergency. Auburn University Department of Public Safety released a video demonstrating what to do if there is an active shooter on campus, it is beneficial for every college student to watch. The acronym used in the video is ALICE: Alert, Lockdown, Inform, Counter, and Evacuate. The letters do not have to be used in this order, the situation determines what should be done. Alert refers to how you learn about the danger. Lockdown refers to locking and barricading the door between you and the aggressor. Inform refers to telling the authorities where you are and where the aggressor is. Counter should be used if the aggressor makes it into your safe area. Do not just hide. Distract and disrupt the aggressor by throwing whatever is at your disposal: book bags, books, desks, or whatever is within reach. The police suggest that Evacuate is the best option; remove yourself and anyone else from harms way if at all possible.